Of the Incas’ impressive legacy in Peru, the Pachamanca is one of their most innovative and downright delicious cultural remnants. 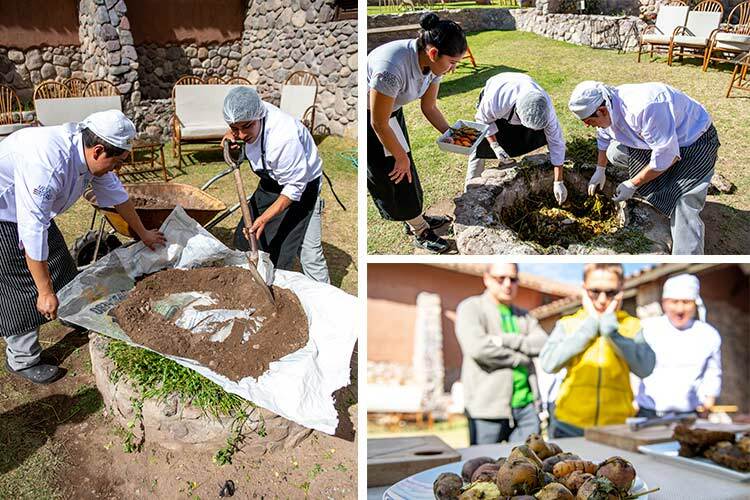 Still practiced and enjoyed across the Peruvian Andes, this earthen barbecue is a doorway into the flavors that colored Incan life and the rituals that connected the intelligent Inca civilization to Mother Earth, or “Pachamama” in their native tongue of Quechua. Let’s explore the intricate meaning and method behind the Pachamanca meal. Warning: This will make you hungrier than ever for your custom trip to Peru. That is guaranteed. What is Pachamanca and where can you experience it in Peru? In the language of the Incas and many of today’s Andean inhabitants, Pachamanca translates to “earth” (pacha) and “pot” (manca). 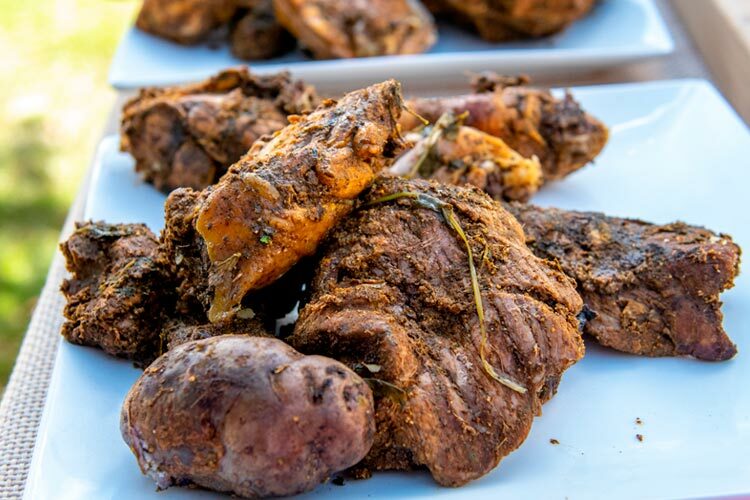 Essentially, it’s an underground earthen pot, or barbecue, composed of stone-heated meat, potatoes, and herbs. The entire ritual is equal parts nourishment and tribute to the earth’s bounty, as a well as reason for the community to gather and share a meal together. 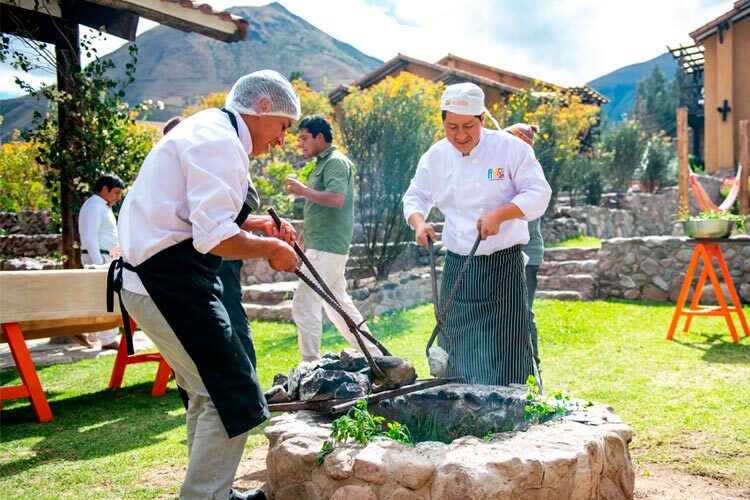 On your tailormade Peru holiday, the best and most authentic Pachamanca experiences take place in the Sacred Valley of the Incas surrounded by the snow-capped peaks of the Andes Mountains. 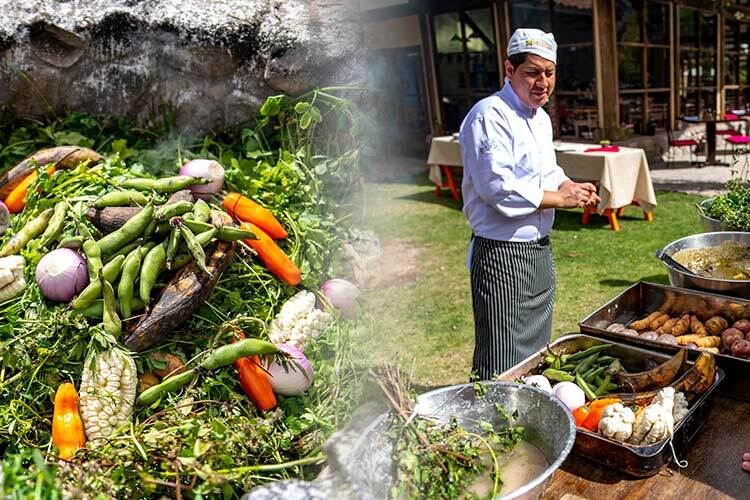 Though you may also find this age-old meal on menus in restaurants in Cusco and Lima, there’s nothing like dining on herb-roasted Andean ingredients steps from the earthen oven that cooked them. The process of preparing a Pachamanca begins by filling banana or plantain leaves with potatoes, corn, beans, and meat, such as chicken, pork, or alpaca, while the volcanic stones that eventually cook these leaf-wrapped parcels heat over an open fire. Once sufficiently heated, the stones are then laid at the bottom of the earthen oven, followed by piles of native herbs, including huacatay, a type of wild mint. Then, the meat and potato parcels are added and topped off with a thick layer of banana leaves and paper. Dirt is then thrown on top to seal everything inside. In typical Incan ritual, an offering of chicha (a fermented corn drink) is then poured over the top of the oven as a final toast to Pachamama and the one-hour clock until mealtime begins. After roughly an hours’ time, the shovels come out and plates are filled with fall-off-your-fork meat and potatoes flavored by the smoky herbs cooked beneath them. Oftentimes, a range of sauces are available to further flavor the meal, including a local cheese-based favorite known as huancaina. Will your luxury Peruvian vacation include a Pachamanca experience? The experiences to be had on a tour of Peru are endless and the ancient Inca Pachamanca tradition is one you do not want to miss. Get in touch with a Kuoda Travel Designer to begin planning your ultimate journey to Peru, Pachamanca included.